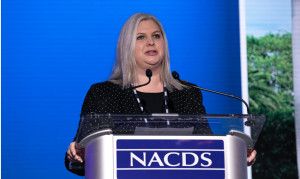 PALM BEACH – The National Association of Chain Drug Stores’ campaign-style approach to the issues crucial for pharmacy value and viability dominated Monday’s opening session of the 2019 NACDS Regional Chain Conference. NACDS president and chief executive officer Steven Anderson led an interactive discussion including members of the NACDS senior staff regarding advocacy on DIR fee reform, broader reimbursement issues, opioid-abuse prevention and expanding pharmacy’s scope of business. In the pursuit of DIR fee reform and other ways to help reduce patients’ out-of-pocket drug costs, Anderson emphasized building on the new 2018 law that bans “gag clauses” that previously prevented pharmacists from advising patients when they can save money by paying cash for prescriptions rather than using insurance. He cited data from a January 2019 survey conducted by Morning Consult and commissioned by NACDS. Rebecca Bubel, 2019 NACDS Regional Chain Conference chair and senior director of store operations for Kinney Drugs Inc., carried on a time-honored tradition of describing her company’s approach to pharmacy patient care – thus providing a testimonial of pharmacy’s role as the “face of neighborhood healthcare.” She also described the company’s commitment to collaboration with suppliers to meet consumers’ needs.